Hurricane Frank has formed in the Pacific off Mexico's coast while a new tropical depression formed in the Atlantic. Frank has maximum sustained winds Wednesday near 75 mph. The National Hurricane Center in Miami says Frank could get stronger as it moves away from Mexico's southwestern coast. 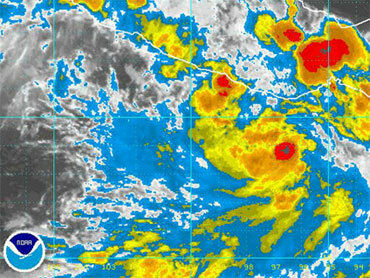 Frank is located about 170 miles south of Manzanillo, Mexico, and is moving west-northwest. In the Atlantic, a new tropical depression formed and has maximum sustained winds near 35 mph. It's expected to strengthen and become a tropical storm later in the day. The depression is located about 430 miles west of the southernmost Cape Verde Islands. Also in the Atlantic, Hurricane Danielle is moving west-northwest with little change in strength.